Getting your right elbow, (for right handers) is a risky move. You’ve probably heard of stuck and behind you? Once you get your right elbow behind you in the back swing you make it difficult to get the golf club back in front of you at impact. Your only resolve would be to throw your hands at the ball which could cause a snap hook. Most likely you will bail the ball out to the right because you can’t recover. Here’s a drill that might help you. Byron Nelson used to talk about getting your right elbow in your gut on the downswing. Same thing really. How Would You Like To Play Golf In Scotland…Without the Airfare! Now is the time of year that Pendleton Golf Club in Ruther Glen, (just north of King’s Dominion) looks like an authentic Scottish Links Course. Now that the Bermuda grass fairways turn a golden brown, (the Bermuda grass goes dormant during the winter) I get the same sensation I had in Scotland in the summer. Even though the Bermuda grass fairways appears tan, the ball sits up beautifully as if it were on a brush. We had a great time Saturday and I highly recommend playing at Pendleton. Rates are low this time of year so call Jim Mason at 804-448-4727. Pendleton has FIVE tee boxes! The Ladies tee is very friendly and placed in front of any hazards one would have to clear. The senior tees allow our senior golfers to enjoy themselves on a Championship caliber golf course without feeling beat up after the round. You have the white tees, which are a reasonable challenge. The blue and black tees are not for the golfer that is short off the tee. It is a different golf course from the black tee. For instance, if you are playing from the white tee on number 5, (a par 5) you can hit it over the trouble if you can fly the ball about 225 off the tee. If you’re playing from the black tees you can forget it, unless you can hold the ball in the air 270. You won’t find a better driving range to practice from. The driving range tee has been cross seeded with rye grass so it’s nice and green. One feature I enjoy is the real target greens with laser yardages. To get to Pendleton just get off exit #110 on I-95. Go west to US 1. Go south about 1/2 mile to the brick front entrance. Follow the signs to the club house. I highly recommend the chicken salad sandwich for lunch. The staff is friendly, helpful and go the extra mile to make your day is an enjoyable one. Are conditions absolutely perfect, no. It’s winter time! I personally can’t wait to get back next week. Posted in On Course Golf Instruction Experience. Today Was The First Day Of The New On Course Format – Hosted by Birkdale. Boy we had a great day at Birkdale Golf Course. I’m looking forward to our Saturday session at Pendleton. I can NOT fully express my thanks to the fine folks at Acumen Golf for allowing us to use Birkdale as our Chesterfield golf course site. If you haven’t been out to Birkdale, you will be very impressed with the improvements. The new owners have put together a great professional staff headed up by Chris McNeil PGA Head Professional along with a fantastic organization for outings. They’ve also made some upgrades in the club house eating area with a BIG screen TV and a comfortable area to watch the game after you’re done playing. The day on the golf course was fantastic and the golf course is in great shape. Yes some of the greens have been recently aerated and of course this is the time of year when maintenance is done on the greens BUT any work being done was NOT a factor in our play. I thought the greens rolled well for this time of year. The fairways are totally Bermuda and in great shape. Tee boxes have been seeded with either a Bent or Rye and it adds a classy touch. Here’s what happened on our first day. 1) We started out at the putting green, working on those very important short putts. One excellent feature of the practice putting green at Birkdale was the access to special holes that were smaller than the regulation cup. A wonderful training tool to practice putting at these smaller holes, so that the real cup looks large by comparison. 2) Next step was long putts. 3) We hit some balls on the range then off to the first tee. 4) I play from the back tees but you can play what ever tee that suits your game. You will have a good challenge where ever you tee it up. I will be providing a Special Report on recommended course strategies, shortly. We played the entire 18 holes and I can not wait to play it again. I am convinced that this new format is the BEST way for me to see you perform on the golf course. You also have the opportunity to observe what I do, both with the golf swing as well as that important short game and club selection. When you play with better golfers you will improve just by observing. 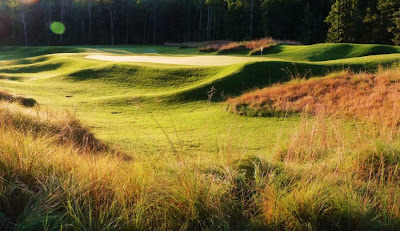 If you’re interested in playing Birkdale on your own, just call 804-739-8800 and then enter 100. They have some great off season rates right now and remember to take advantage of the special small holes on the practice putting green. Oh yes, we had lunch after playing. I had the Buffalo Wrap and it was great. They have FREE coffee. You know how Cubans like coffee!One thing we learned from this on course session is that alignment WILL have an effect on your golf swing motion. Why? Because your eye has no idea that you are improperly aimed so you will do whatever it takes to get the ball to go to the intended target. Example; you align yourself to the right with your feet, (or closed) and open in the shoulders, (to the left). This improper position will cause you to swing across yourself or “over the top” being that your eye knows that the hole is left of you. To work on alignment skills try this drill. Watch for further Blog entries on our, Play Golf With A PGA Pro! I Did a Video Analysis of My Own Swing This Time…Now You Can Laugh at Me! As I said in the offer for joining the new lesson membership, I too will be working on my golf game right along with you. I started officially yesterday. Like I mentioned, I do NOT have the kind of time to practice now like I did in my early years when I played for a living. Now I’m in the same boat you’re in. I did get a good hour in though and took some video of it and did an analysis. You will be able to see the difference in the videos of my swing as well as your own during this process. Tomorrow we start a blitz of workshop lessons at Patterson Golf Park. Bunkers, putting and 80 yard shots. I’ll post some commentary on that tomorrow. To get to the video analysis of my swing just go here. Once you get on the page, look at the list of swing analysis of PGA pros.